Holly Levis-Dolan knows radio and she loves her dogs. 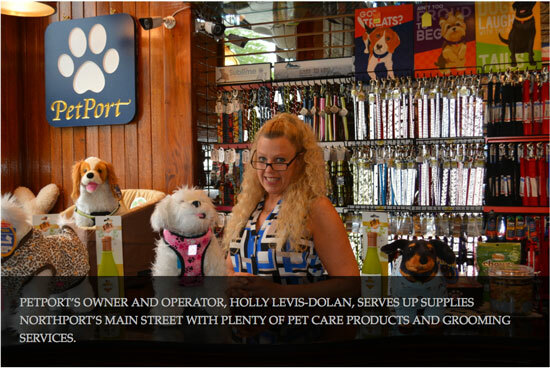 Just as she once played the hits to listeners craving a good tune, Levis-Dolan continued to satisfy consumers’ appetites – but, with PetPort, she was working with appetites of primarily canine descent as she served up “the cream of the crop” in pet foods and supplies. Levis-Dolan continued to “play the hits” and PetPort – just like any quality radio station – took off. All natural pet food, supplies, toys and everything in-between, fill PetPort’s shelves and everything is guaranteed to satisfy – and they’re all priced just below, or in line, with that of the world’s biggest pet stores. 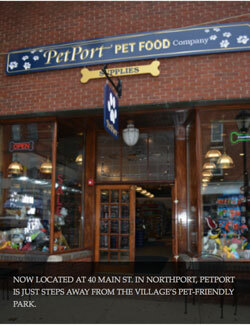 Today, PetPort “broadcasts” out of a new home at 40 Main St. in Northport Village – the “perfect” spot for the shop, she said. Levis-Dolan coveted the location for its beautiful interior, welcoming storefront and prime positioning, just steps away from Northport Village’s pet-friendly park. “People come here from Melville, Port Washington, [etc.] – it’s a destination village to come to with your dog,” she said. As with any radio station, though, playing the hits could only take PetPort so far. Behind the essential quality supplies and services, PetPort’s staff and groomers serve as the “radio personalities” that keep customers coming back thanks to their expertise and welcoming professionalism. Master Groomer Bernadette Romeo – “the best groomer on Long Island,” as Levis-Dolan described her – and a talented young groomer, Melissa Fahey, make up PetPort’s grooming duo. The two not only deliver quality hair care and spa treatments, but they also ensure that every animal left in their care is treated attentively with tender love and care in absolutely every regard. 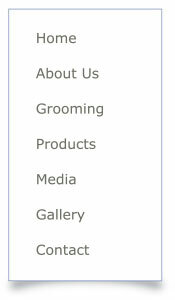 Appointments can be made for PetPort’s grooming spa by calling the shop at 631-261-7222.